I am not an expert in efficiency or homemaking, far from it. But what I am decent at is confronting my shortcomings head-on and finding workable ways to live with them. Most recently this meant confessing that I would never master an exercise routine until I signed up for classes that require showing up on time. I can show up on time (or at least close to on-time) to a set appointment, but I cannot muscle exercise to the top of my to-do-on-my-own-time list. As soon as I stopped fighting against my own temperament and weakness, I was able to find a solution that actually worked for me. So, along the same line of thinking, here are some other life-hacks for Emily. Things that make my life work for my own often unmotivated or overcommitted self. There are three Apps I rely on profoundly to free up brainpower. I read once that the best practice is to relieve your brain of having to remember things. Have a trustworthy system that is outside of your brain that does all of the remembering for you, so that you can use your brainpower to do things your brain is actually good at, because brains are lousy at remembering. Teux Deux (which I use in tandem with Evernote). 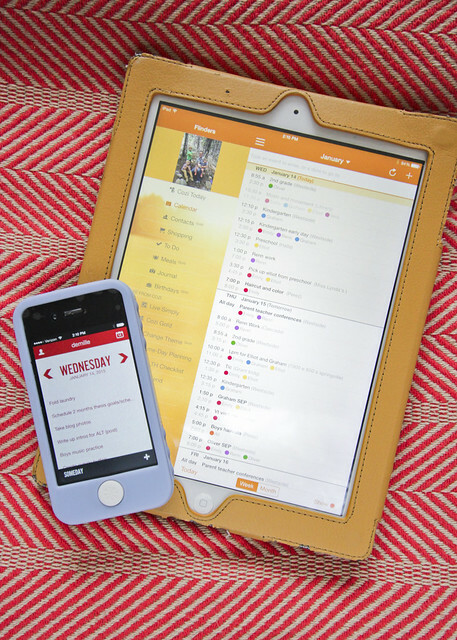 Teux Deux lets me list my to-dos in a calendared style, which lets me construct a list for each day, along with options for un-calendared lists. When I start breaking down larger projects, they usually turn into evernote pages, or sometimes google docs (if they need to be shared with Mr Renn). Lastly: 1Password. It's not cheap, but I highly recommend finding a way to keep your passwords diverse, long, and secure, and that does not require you to remember very much. It makes life so much simpler when you never have to guess what your password is. In an effort to keep my skin and immune system happy, I currently take a lot of supplements. (Some probably more effective than others). I have to sort them into an octogenarian-style pill dispenser box and keep it on my kitchen counter in plain sight. Or I would never ever remember to take them. In an effort to not have the crepe-y skin of someone 3x my age, I am trying to drink a gallon of water a day. I rarely succeed, but I start each day with 2 32 oz contigo bottles of water. The first has a scoop of Scivation Xtend (to help me not be stiff as a board after each workout,) and the second usually has some crystal light, because I stopped fighting myself over my inability to drink a lot of straight water. Also: epsom salts, in a hot bath, post-work-out. Usually at least one kid wakes up before I can finish and get dressed, but along with the Scivation, it helps me avoid the crazy muscle stiffness I was battling back in July when I started exercising. Plus it feels indulgent, and sometimes that is a good thing all around. My routine has an obvious dearth of self-grooming time, so dry shampoo is my savior. Lots of buns, twists, and ponytails, I try to spray a dry-shampoo on my roots before bed, then again before I brush it out and pull it up. Far, far from ideal, but since I only manage to wash my hair about twice a week lately, it's being sufficient. Speaking of buns and twists. Two words: spin pins. Game changer for someone with hair as stubbornly straight (and thin) as mine. Though from what I gather they are amazing no matter what your hair type. Lastly, to survive 0% humidity in Utah winters I have to have products that work, and have them handy in lots of convenient places. I own about 40 tubes of Blistex Medicated Lip Ointment, and have one in every coat pocket and purse or diaper bag, plus several for pockets of pants. It works wonders for me and is cheap enough to buy ridiculous amounts of. 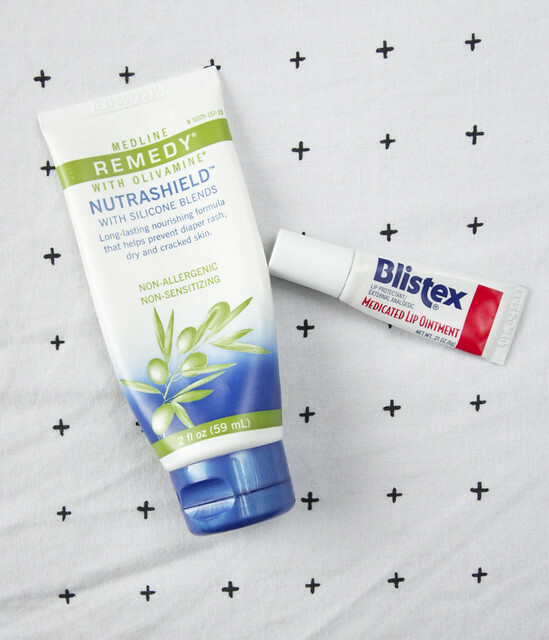 I also have to keep tubes of Remedy Nutrashield on hand, because my kids' hands get so dry they crack and bleed if I don't stay on top of them every.single.day. (Usually last thing before I send them off to school: comb hair, brush teeth, tallow hands.) This stuff is amazing for keeping their hands and mine happy and supple as long as I persist in using it at least once daily. (We also love Remedy's Skin Repair Creme for the Captain's eczema and use it on every single one of us after every bath or shower, year-round). So, those are some things keeping us all in reasonable order this winter. What's working for you? I love nothing more than life hacks that work for those of us with finite energy.